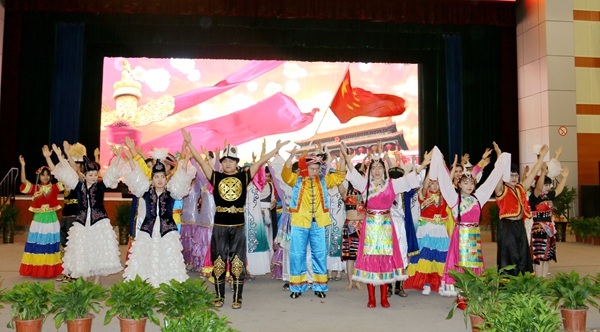 On May 6, NWAFU held the 4th Ethnic Culture Festival as scheduled. Nearly 1,000 students and teachers appreciated ethnic cuisines, ethnic singing and dancing, national culture, and handicrafts with ethnic characters. Through vision, smell, taste, and hearing, NWAFU presented a feast of diversified ethnic cultural feast. Han had calligraphy went nicely and smoothly like floating clouds and flowing water, lifelike paper cuttings, and lantern riddles combing entertainment and education. Uyghur presented beautiful and elegant dancing, fresh and delicious kebab, and superb musical instruments. Tibetan showed lively paintings, distinguished costumes, and butter tea which had linger aroma. In addition to these, Kazak’ yurt experience; Mongol’s Shatar – Mongolian chess; Zhuang’s bamboo dance, Korean’s Touhu game; Bai’s steamed cake and bean jelly, Manchu’s eight banners, Hui’s covered bowl tea, Yi’s serving dish dances, Khalkhas’ Napoleons, Tujia’s oil tea, and Miao’s silver jewelries… There were numerous traditional skills and food cultures on the site. Young people in national costumes warmly introduced the cultural customs of their hometown which gave the participants immersive experience of the ethnic charm.